In pharmacology, the clearance is a pharmacokinetic measurement of the volume of plasma from which a substance is completely removed per unit time; the usual units are mL/min. The quantity reflects the rate of drug elimination divided by plasma concentration. The total body clearance will be equal to the renal clearance + hepatic clearance + lung clearance. Although for many drugs the clearance is simply considered as the renal excretion ability, that is, the rate at which waste substances are cleared from the blood by the kidney. In these cases clearance is almost synonymous with renal clearance or renal plasma clearance. Each substance has a specific clearance that depends on its filtration characteristics. Clearance is a function of glomerular filtration, secretion from the peritubular capillaries to the nephron, and re-absorption from the nephron back to the peritubular capillaries. Clearance is variable in zero-order kinetics because a constant amount of the drug is eliminated per unit time, but it is constant in first-order kinetics, because the amount of drug eliminated per unit time changes with the concentration of drug in the blood. The concept of clearance was described by Thomas Addis, a graduate of the University of Edinburgh Medical School. It can refer to the amount of drug removed from the whole body per unit time, or in some cases the inter-compartmental clearances can be discussed referring to redistribution between body compartments such as plasma, muscle, fat. When referring to the function of the kidney, clearance is considered to be the amount of liquid filtered out of the blood that gets processed by the kidneys or the amount of blood cleaned per time because it has the units of a volumetric flow rate [ volume / time ]. However, it does not refer to a real value; "the kidney does not completely remove a substance from the total renal plasma flow." From a mass transfer perspective and physiologically, volumetric blood flow (to the dialysis machine and/or kidney) is only one of several factors that determine blood concentration and removal of a substance from the body. 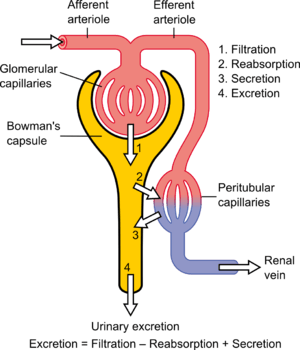 Other factors include the mass transfer coefficient, dialysate flow and dialysate recirculation flow for hemodialysis, and the glomerular filtration rate and the tubular reabsorption rate, for the kidney. A physiologic interpretation of clearance (at steady-state) is that clearance is a ratio of the mass generation and blood (or plasma) concentration. Most plasma substances have primarily their free concentrations regulated, which thus remains the same, so extensive protein binding increases total plasma concentration (free + protein-bound). This decreases clearance compared to what would have been the case if the substance did not bind to protein. However, the mass removal rate is the same, because it depends only on concentration of free substance, and is independent on plasma protein binding, even with the fact that plasma proteins increase in concentration in the distal renal glomerulus as plasma is filtered into Bowman's capsule, because the relative increases in concentrations of substance-protein and non-occupied protein are equal and therefore give no net binding or dissociation of substances from plasma proteins, thus giving a constant plasma concentration of free substance throughout the glomerulus, which also would have been the case without any plasma protein binding. The change in the mass of a toxin within the body ( ) during some time is equal to the toxin intake plus the toxin generation minus the toxin removal. 1 2 peck & hill. pharmacology for anaesthesia and intensive care. p. 65. ↑ "Pharmacokinetics objectives". Pharmacology2000.com. 2006-12-27. Retrieved 2013-05-06. ↑ Seldin DW (2004). "The development of the clearance concept". J. Nephrol. 17 (1): 166–71. PMID 15151274. Available at: http://www.sin-italy.org/jnonline/Vol17n1/166.html. Accessed on: Sept 2, 2007. ↑ Babb AL, Popovich RP, Christopher TG, Scribner BH (1971). "The genesis of the square meter-hour hypothesis". Transactions - American Society for Artificial Internal Organs. 17: 81–91. PMID 5158139. ↑ Gotch FA, Sargent JA, Keen ML (2000). "Whither goest Kt/V?". Kidney Int. Suppl. 76: S3–18. doi:10.1046/j.1523-1755.2000.07602.x. PMID 10936795. Also, for clearance via bile please see: Estimation of Biliary Excretion of Foreign Compounds Using Properties of Molecular Structure. 2014. Sharifi M., Ghafourian T. AAPS J. 16(1) 65-78.